Summer vacation is in full swing around here and although I think that I will have all this extra time on my hands to prepare nice meals for my children, that absolutely does not happen. Our daily ritual seems to be falling into the house, hot, hungry, and exhausted, at about 4:30pm. At that very minute, the clock starts ticking. Tick. Tick. Tick. If dinner is not on the table in the next 30 minutes, I will have a sobbing heap of little people on the floor. Today was no exception so when my daughter suggested breakfast for dinner, I jumped at her brilliant idea. I’m not positive that there is really such a thing as a “Scrambled Omelette” but I am sure that as soon as you read the title of the post, you had an idea what would be coming your way… Prepare all the lovely goodies that you might normally find in an omelette but scramble some eggs around them instead of patiently waiting for your eggs to become an omelette. So easy! 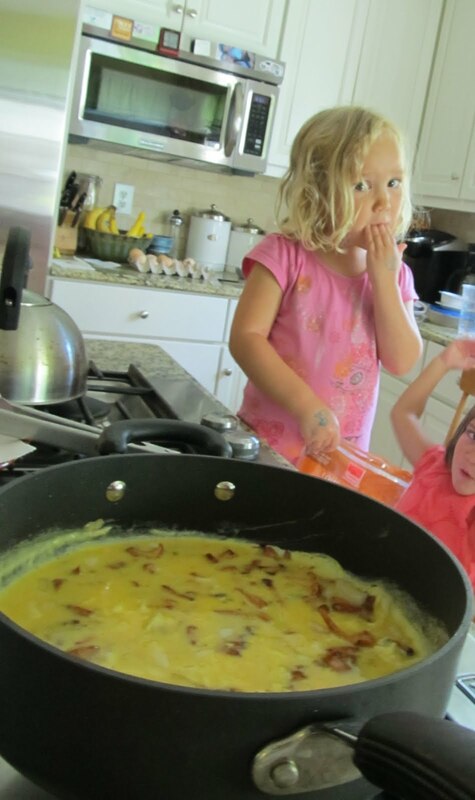 For our “scrambled omelette” I knew that we had to use some of the chanterelle mushrooms that were dropped off on my doorstep the other day. I kid you not – over a pound of beautiful chanterelle mushrooms. It seriously pays to be friends with farmers. If you don’t know a few, I suggest you head as fast as you can to your local farmers market! I have been incorporating these delicious, meaty mushrooms wherever I can into our menu this week. Yum. Almost every culinary adventure in my house begins by scrounging around in the fridge to see if there is “just a bit” of anything left hanging around that needs to be used up. Today I found 3 lonely slices of bacon and the last wedge of a sweet Georgia vidalia onion. Perfect for our breakfast for dinner endeavor. 1. Gently fry the bacon. Set aside on paper towel. 2. Saute the mushrooms and onions in the bacon drippings. Sprinkle with kosher salt and fresh ground pepper. 3. Lightly whisk eggs and a little bit of milk in a small bowl. For 4 children and 1 adult, I used 6 whole eggs and 2 egg whites (leftover from making ice cream yesterday). 4. Pour the whisked eggs over the sauteed mushrooms and onions. 5. Gently scramble the eggs around the mushrooms and onions. I like to let the eggs cook a bit and then pull the egg toward the center, starting at the edge of the pan. 6. When the eggs are cooked, remove from heat. Sprinkle with crumbled bacon and shredded cheese. Enjoy!! We served our scrambled omelette with fresh (organic!) blueberries from Deer Haven Hills Farm .